We’d love your help. 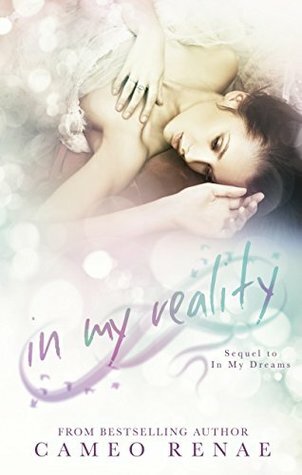 Let us know what’s wrong with this preview of In My Reality by Cameo Renae. Lately, I’ve had a recurring nightmare—a It’s been three years since Michael’s death, and life isn’t any easier. The gift bestowed upon me has only grown stronger. I see the dead, everywhere. Those who have remained earthbound are looking for answers, or have messages for their loved ones. That’s what I do. I help resolve those questions, then assist them in crossing over. To ask other readers questions about In My Reality, please sign up. Ok I loved this book. Up until the huge twist. Yes I get the ending. I do. But I was disappointed how it ended. Life is about loving and accepting but also learning to deal and live with heartache. And that's not what happened. She never got a chance to live on her own and find her own way. Beautiful story! Another amazing book from Cameo Renae. Had to fight back the tears reading this beauty. Highly recommended to every paranormal romance lovers! This woman can write a book! I mean she can make me laugh, and cry and feel all the feels in one sitting. This is the sequel to In My Dreams. I did not think I could find a better executed book than any of her other books, boy was I wrong. Mrs. Cameo Renae poured all of her heart and soul into this sequel. I will not spoil it for you except to tell you that you will need tissues and please do not throw your device as you will want to find out how it all ends! The massive ending is WOW. Just WOW. I will not spoil it for you except to tell you that you will need tissues and please do not throw your device as you will want to find out how it all ends! The massive ending is not how it seems! Great job Cameo! Thank you again for another spellbinding ride! Fate is such a fickle thing. Lizzy travels to California for spring break, and encounters a neighbor who looks similar to Michael. Add in some ghostly intrigue and some drama and you have Lizzy emerging from the cocoon she was living in Alaska. After being numb for three years, Lizzy questions the feelings she has for Mason in less than a week. When tragedy strikes will all be lost or will Lizzy get her happily ever after? Holy hell this book was so amazing! I am a huge fan of Cameo Renae's. She has so much heart in her books that you can't help but be sucked in and love and befriend the characters. After reading In My Dreams, and thinking it would be the only one was hard, but Hidden Wings satisfied in ways I can't explain. And then she announced In My Reality, the excitement was too much. This book was so full of everything you could want out of a book! Heartbreak, triumph, strength, spookyness, friendship, hot g Holy hell this book was so amazing! I am a huge fan of Cameo Renae's. She has so much heart in her books that you can't help but be sucked in and love and befriend the characters. After reading In My Dreams, and thinking it would be the only one was hard, but Hidden Wings satisfied in ways I can't explain. And then she announced In My Reality, the excitement was too much. I read In My Dreams and in my reality in two days! I couldn't put it down . This book takes place three years after the death of Michael. Her friends Tyler and Emily take her down to their college in California for spring break. Again, like her first book she has a great pace to the book and has added in some good new characters and situations that drive the story forward. And, the ending!!!!!! Was beautiful. I loved this book series far more than I would have ever suspected.I need this to be a mov I read In My Dreams and in my reality in two days! I couldn't put it down . And, the ending!!!!!! Was beautiful. I loved this book series far more than I would have ever suspected.I need this to be a movie pronto, because it would be a great teen romance film. I loved this book. I read the first, In My Dreams, and it was all right. This book was so much better than the first. It was well written and virtually free of editing errors. I felt like Lizzy, as a character, had grown so much from the first book and I really liked her in this one. I was also surprised by the ending. I thought it was going one way, then WOW! This is definitely a book worth reading. I was so excited to read the second book. You just had to know how Lizzy moved on in her life! She had been dealt a difficult life and nothing seemed to get better for her. She was living life on auto pilot. Helping others because they would confront her. Her BFF and Tyler came to take her away from her everyday life and visit them in the sunny life while they were in College. Lizzy actually has some fun times, except for the guy who sneaks into her heart. Best ending to a true love story! I would recommend this book series to anyone. Heart warming and wrenching at times but keeps you going and wanting more. It shows you what real friends and love is like and possible to have. You just need to believe. Thank you Cameo for your amazing and awesome writing. I was trying to avoid ugly cry and emotional books, but damn you, Cameo, you got me. You pulled me in and caught me. The start was a tiny bit slow, but it soon became suspenseful and i couldn't stop reading. I just had to know what happened next. Well done, Cameo. You did it again. P.S. make sure you have your tissues handy when you read this. Incredibly good. Lizzy's struggle to move forward after losing the love of her life is relatable: heartbreaking, funny, exciting, scary, and confusing. Cameo brings you in and makes you feel everything. The first book was great as I loved the characters. This book made me love the characters even more. I recommend these two books to anyone who likes this genre. I have read several of this authors books and loved them all. I didn't want this book to end!! I jumped right into one after reading In My Dreams. I couldn't stop myself. It can be a standalone but trust me you WANT to read the first one. You HAVE to read the first one! The emotions...the love...the..EVERYTHING!!! You NEED these two books in your life!!!! WoW!! Just WoW!!! I love a book that leaves me guessing how the next chapter is gonna be and ultimately blows my mind! Cameo Renae has a unique gift in writing and an Awesome mind! Just WoW!! The trip to the zoo had me laughing so hard my stomach hurt. With this final book in the series you will become angry, you will laugh so hard you can't breathe and then you will cry so hard that you can't read as the tears blur your eyes. This book is based three years after the first it's been a hard three years for dizzy however after more trouble, some fantastic help by her friends she manages to find love again and get her HEA. I really liked this book a lot! It starts off a little slow, but picks up! Must read. This second book has just as much, if not more, excitement than the first. Things get emotional again so be ready for a tissue or two. I am still in shock over this book! I was hooked from page one and still can't believe the ride Cameo Renae took me on while reading this story! I was happy, sad, angry, shocked and confused all in a matter of a few chapters. Just when I thought I had things figured out something would happen and shock me some more. If you loved the first book you definitely need to add this to your must read list. I'm pretty sure I'm gonna have a book hangover for a long time from this! The first book in this series was heart breaking and many asked for a happier ending and they got what they asked for. The journey was bumpy but the ending was beautiful. That's all I'll say don't want to give anything away.